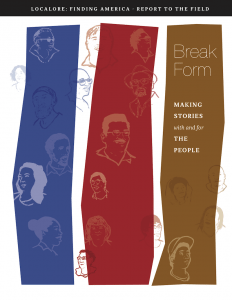 “Break Form: Making Stories With and For the People” presents findings from an extensive study drawn from the work of AIR’s 15 Localore: Finding America independent producers, our station partners, and a far-reaching network of community collaborators. Here, we present a distillation of some of the key takeaways. The full report, including a new Edison Research study commissioned by AIR, Greater Public, ITVS, NFCB and PRPD are available for download here. Viewing media through a wider lens enabled me to see the Finding America projects for what they are — a mix of reporting, anthropology, ethnography, engagement, and art. … Telling stories with and for people, instead of merely treating people as “sources,” is no easy task. The Finding America producers faced myriad obstacles while taking on the job of inventing new models for storytelling … Some of the [steps] below involve finding ways to challenge traditional journalistic practices and mindsets. Others relate to assumptions about what public media should sound like, and whom it should serve. Still others are institutional — making and sustaining change is hard. Our intention is to help advance the innovative work already underway across the county, and to encourage other producers and stations who share our vision for a more inclusive public media to push beyond convention and embrace new forms of stories made with and for the people. Read on, and take time to visit our metadocumentary where all 15 communities come together in a rich array of audio, video, and social media stories. 1. Make room for work beyond the deadline-driven 24-hour news cycle. The alternative to hard news can be just as sharp and sometimes even more direct and meaningful. Let the community direct your storytelling. Seek help from new talent, inside and outside. Seek help from new talent, inside and outside. Many of the lead producers said they operate independently because it gives them the freedom to tell stories that move beyond the “if it bleeds, it leads” adage. Managers would do well to work with more independent producers who can pursue stories that aren’t necessarily tied to breaking news or trauma or tragedy. This raises a larger issue about the importance of creating a newsroom culture that doesn’t just look for outside talent but that also encourages this type of storytelling from within. Without support from upper management, these stories remain at risk of being untold. Download the full PDF to read more about making room for work beyond the 24-hour news cycle. 2. Adapt to the different styles and sounds you will get from community collaborators. Telling stories with and for the people requires close collaboration with community members — and an understanding that they may not be as available or as willing to help as you expected. See yourself less as a reporter, and more as a director and editor. Identify strong community figures and empower them to make the story themselves. See yourself less as a reporter, and more as a director and editor. Six of Finding America’s teams produced a set of features for All Things Considered in the lead-up to the 2017 presidential inauguration. These non-narrated stories were told entirely by community hosts. AIR’s lead producers worked behind the scenes, acting as directors and editors of the stories. “I love how direct non-narrated pieces feel to a listener,” said Every ZIP lead producer Alex Lewis. “When they’re done well, people come away feeling as if they’ve been introduced to someone in a deeper way.” This approach isn’t about foregoing your role as a trained storyteller. It’s about finding opportunities to share creative processes with others in the community and loosening control so all of the power doesn’t lie with the journalist. Download and read the full PDF for more tips on how to work with community collaborators. 3. Get comfortable working with those in the community who are switched on and tuned in. These individuals include, churches, nonprofits, and people who have a stake in an issue and a decided point of view. View those in the community who are switched on and tuned in as allies who can identify problems and prompt you to seek solutions. Anticipate challenges. View those in the community who are switched on and tuned in as allies who can identify problems and prompt you to seek solutions. These allies work deep inside communities and are often privy to problems that the community faces. Investigate the problems they surface, but don’t get stuck there. “I don’t think we in the public sphere should shy away from the tough stuff, because sometimes going to the root of a community’s pain is where you’ll find solutions for healing that pain,” Libby said. Challenge yourself to look into potential solutions. Seek out positive deviants — people, stories, or organizations that are more successful or effective than average. Consider: Who is taking on the problem? How have other communities tackled it? It’s possible that the people who are most actively involved are closest to the solution. Anticipate challenges. Working with those most active in the community requires you to set clear boundaries and anticipate challenges. Ask yourself guiding questions ahead of time: If your collaborator is asking for editorial control, how will you answer? How will you respond if listeners/viewers/readers feel that, by presenting new and authentic voices from the community, you are biased? Being transparent — with your editor, with your collaborators, and with your audience — is key. Collaborating with people who are vocal about their viewpoints and political ideologies puts the onus on you to make sure the related stories you produce include context and a range of perspectives. The goal is to create stories that are inclusive and informed by collaborators who know a community from the inside out. We’ve got examples and tips on working with switched on community members in the full report on our Report Page. 4. Move your focus beyond your core, older, white audience. Collectively, “Finding America” producers have reached wide-ranging groups of people, including individuals who had never tuned into public media. Seek out luminous characters in new corners of the community. Learn to question your own biases as a producer. Learn to question your own biases as a producer. Remember that even if you feel your own identity and beliefs might be underrepresented, it’s important to consider whether the views and experiences of those least like you are also being marginalized. Done well, public media should report on the full range of public opinion, and should include people who sound like all of America rather than some generic “radio voice.” The Finding America producers challenged themselves to push past biases and assumptions. Their stories originated in the community — not in the newsroom — and painted a well-rounded picture of people and neighborhoods that are often depicted through a narrow frame that perpetuates single narratives and stereotypes. In essence, they reflected “public” media in a literal sense of the word. For more on the lessons we learned from moving beyond a core audience, download the full report. 5. Use live events to bring together different parts of the community. Use a wider lens when telling stories about people who are considered “marginalized.” Public media has an opportunity to bind the human experience through the stories it tells, the projects it pursues, and the events it holds. It’s no doubt important to paint a well-rounded picture of communities that aren’t typically highlighted in media, or that are too often defined by a single narrative. But challenge yourself to go a step further — by finding ways to bridge the gap between these communities and those who are better off — and be open to advice from community collaborators. When first starting his Storymakers project, lead producer John Biewen said he planned to create a storytelling project focused on the experience of people of color in East Durham in response to the national focus on cities where unarmed black men had been shot by police. “My thought was to invite the stories of folks in a low-income, heavily policed, largely black community,” Biewen said, noting that one of his community collaborators challenged him on this idea. “Nia Wilson responded that she appreciated the impulse. But she argued that in this time of increased racial tension, what’s needed is engagement by everybody, people from all parts of the community, ‘including white, middle-class people being asked to consider their privilege.’” Biewen agreed and embraced this approach when recruiting storytellers for his project. Want more on how to hit the streets in different communities to make stories? Here’s the full report. 6. Place more value on your local storytelling rather than national programs. Public media’s business model is built largely around nationally distributed programs that drive core audience, especially in public television. Many radio stations are changing direction, but it takes time. Experiment with risk. Give people stories they can’t get elsewhere. Give people stories they can’t get elsewhere. North Country Public Radio’s David Sommerstein — Homefront‘s inside collaborator — said that while the station had covered active military from Fort Drum for quite some time, it hadn’t done a deep dive into the day-to-day lives of the soldier and their families on the base. Lead producer Meredith Turk took a fresh approach by going to great lengths to gain access to a community that is typically guarded and private. Her efforts enabled her to capture stories of triumphs, struggles, and love in an ongoing and consistent way. “What does ‘finding America’ mean? It assumes that something is lost or hidden,” Turk said. “When it comes to life in a military community, there is a growing gap between the families of those who serve and those who do not. It’s not that we don’t know they are there, but we don’t have the opportunity to sit with the people who live that life every day. That’s my job.” Her project changed the sound of NCPR and enabled it to become a more visible presence in the military community. It also distinguished the station’s content relative to the national coverage of U.S. military, providing listeners with a unique, local angle they couldn’t find elsewhere. Download the full report for an expanded look at shifting focus from national programs to local storytelling. 7. Push the boundaries of what “public media” is supposed to look and sound like. This is perhaps the most pervasive and difficult obstacle because it gets at the heart of the perception of what the existing audience wants (and tolerates). Create clear rationale up and down the chain of command. Expect mixed reactions. Create clear rationale up and down the chain of command. To successfully defy convention, there must be clear communication from the bottom all the way to the top. Journalists and newsroom managers must be on the same page about why they want to experiment with ways of breaking with traditional norms. What are the goals and the importance of defying convention? How will you handle bumps that will inevitably arise? What will success look like? Asking these questions and seeking agreed-upon answers before you begin presenting things in new ways will help you create a shared game plan for success. For more on pushing past the boundaries of what “public media” is expected to look or sound like, download and read the full report. 8. Invest resources in live, community-focused events. Social media and online comments sections have created important ways for news organizations, writers, and independent producers to interact with their audiences. But too often, online engagement is seen as a substitute for in-person engagement. Partner with local artists to create a physical engagement tool. Think about design as a form of engagement. Partner with local artists to create a physical engagement tool. Frontier of Change producers Isaac Kestenbaum and Josie Holtzman joined forces with local artists as part of an interactive scavenger hunt they created in Anchorage. Participants were instructed to text a specific phone number. From there, they heard stories that Kestenbaum, Holtzman, and station collaborator Joaqlin Estus produced and then got a clue about where to go to find the next story. The stories explored changes that have occurred in Anchorage in recent history and were intended to help participants think about the city’s future. Participants were given passport books, and the local artists made limited-edition prints in them at each stop along the way. We’ve got lots more on producing live events. Download the full report here. 9. Identify the seeds of innovation that will yield a rich harvest. Sustaining innovation after a period of experimentation is one of the most difficult hurdles to overcome with a project like Finding America. Closely track kernels of progress, help others recognize them, and advocate for support. Connect the dots between the work and the mission. Closely track kernels of progress, help others recognize them, and advocate for support. Be an evangelist for the most promising developments and kernels of progress from the project you want to sustain, and describe how they can be cultivated in a feasible way. Figure out what it will take to sustain a green shoot and how it can fit into your current responsibilities and workflow. Then, have a candid conversation with your boss. Before the incubation phase of Finding America ended, WUOT’s Powell gave thought to how he could help TruckBeat continue to thrive. He talked with WUOT executive director Regina Dean about his desire to keep the project going and received her support to spend 25 percent of his time sustaining TruckBeat and its Tenn Words sister project. Although Powell recently left the station, WUOT is beginning to pinpoint specific opportunities to take the truck out into the community and learn more about the attitudes, concerns, and beliefs of East Tennesseans. There’s lots more in our full report on how to sustain innovation and experimentation. 10. Shake up the status quo by expanding use of independent producers and freelancers. In the period since AIR published its last study – “What’s Outside? Public Media 2014,” there is a greater openness to “outside talent” and greater recognition that there are a lot of creative producers inside of day-to-day operations who are steering newsrooms in new directions. View independent producers as leaders and innovators. Be open-minded about messy experimentation. View independent producers as leaders and innovators. They have the capacity to experiment in ways that newsrooms staff — constrained by the day to day — may not be able to. They often seek stories that don’t fall within the confines of a traditional storytelling beat. Because of this, their work can deepen and expand a newsroom’s storytelling efforts. With Localore and scores of new innovation projects flourishing at the stations and networks, the industry is headed in an exciting direction. Download and read the full report to find more on how to best utilize independent talent.